S wami Vivekananda once exclaimed “Men, men, these are wanted: everything else will be ready, but strong, vigorous, believing young men, sincere to the backbone, are wanted. A hundred such and the world becomes revolutionized.” Even after more than a century we find a dearth of such men as Swamiji wanted. According to Swami Vivekananda, “The brain and muscles must develop simultaneously. Iron nerves with an intelligent brain — and the whole world is at your feet” youth. His own life bears testimony to this. While conducting classes or addressing the youth a wholesome approach to the formation of character and personality is placed before them. 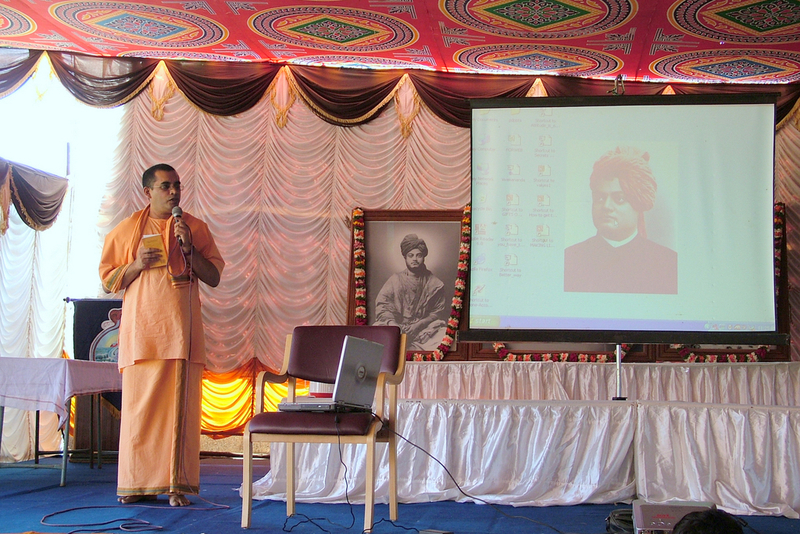 Swamiji’s idea of an ideal youth is put forward and steps to achieve the goal is elaborated upon. The youth is also introduced to the various means by which the fickle and restless mind can be brought under control especially through cultivation of good thoughts and habits, practice and perseverance, concentrated work, prayer and meditation which are sadly lacking in present day education. 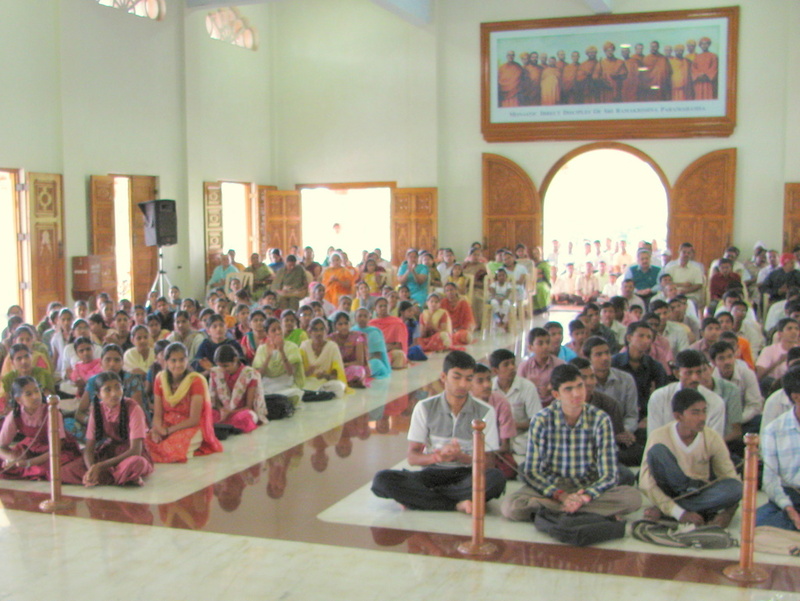 In the classes held for the “Yuvaka Sangha” every Sunday these are taught and stressed. This scholarship scheme has been initiated in the year 2004 to provide monetary aid to needy and meritorious students of senior secondary schools, undergraduate, graduate and post graduate studies in the state of Karnataka every year. The scholarship is paid out of an endowment created for this purpose; the interest accrued on this endowment is utilized for the scholarships. The scholarship amount distributed to the candidate varies from Rs.1,000/- to Rs.5,000/- per year. Exceptional cases may be considered for higher disbursements. These scholarships are given out to students irrespective of religion, caste, creed or gender. The amount can be utilized for tuition fees, hostel fees, study material or other study-related expenditure. 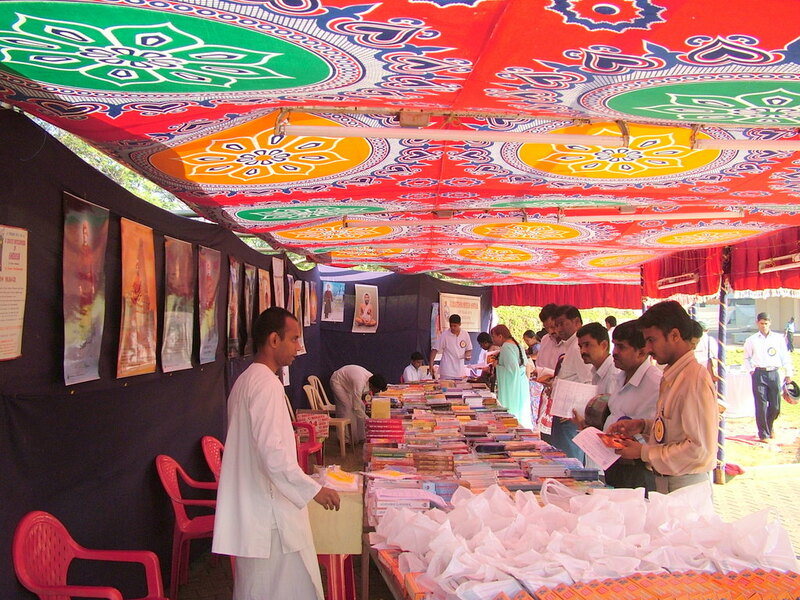 Books chosen from the vast storehouse of Ramakrishna-Vivekananda-Vedanta literature that are especially relevant to the youth are gifted to help them in their character formation and in their building of an all-round personality. 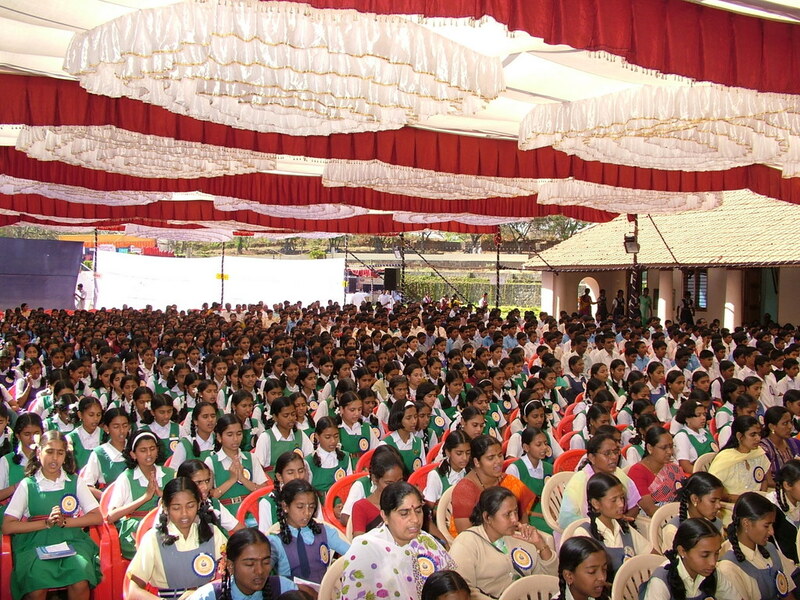 At times Student conventions are organized so that a large number of students can participate and benefit. We invite orators and experts proficient in different fields to address the gathering of students on topics that stimulate and positively orient the energies of the budding youth. Monastic organizations such as the Ramakrishna Order have not few outstanding monks who have developed unique and effective ways of conveying the inspiring and strength giving ideas of Swami Vivekananda and who are much sought after. Many students stand to gain by attending the lectures of monks who are specially invited during these conventions. Usually a question and answer session follows these lectures. Many fundamental doubts get clarified during these interactions. 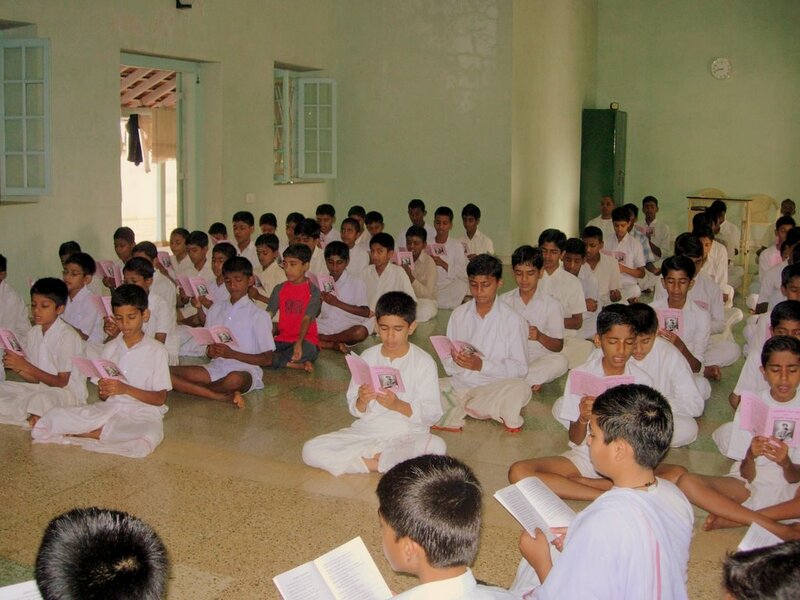 Vasanta Vihara is an annual programme meant to engage school children constructively during their summer holidays. The camp is held in two batches for a duration of 15 days each – one, for children studying from fifth standard to the seventh, and second, for those studying in eighth to the tenth – in the serene and elevating atmosphere of the Ashrama. The underlying focus of this programme is to inspire and instil into the budding youth a hunger for a wholesome personality, encompassing the positive ideas and practical approach of the western mindset, and more so the values and ideals that have roots in our own Indian culture and civilization. These when rightly conjoined and synthesised, in our opinion, will guide and equip the student to face the onslaughts of both the external challenges and internal conflicts. The pow er and influence of books need no mention. We find the recorded ideas, experiences and flights of great and successful people producing a lasting impression on those who read deep into their lives and thoughts. The Ramakrishna Order is more than a century old and has produced some of the finest and outstanding spiritual stalwarts and gigantic intellects resulting in a huge repository of Ramakrishna-Vivekananda-Vedanta literature. Many incidents and ideas of these giants have been recorded, commented and elucidated upon. These records are largely based on the universal and catholic teachings of Sri Ramakrishna, and the powerful and penetrative insight of Swami Vivekananda. They form a seamless bridge between the ancient spiritual tradition and the modern era and serve as a valuable reference for people wishing to tread the long and strait path of spirituality. These books have been translated into many languages so as to reach larger number of people. Books, cassettes and other media are usually displayed before and after programmes. They are also set up in various institutions and public gatherings. Many of these are subsidized books that target the student community for it is at this phase of youth that energies can be most easily canalized.